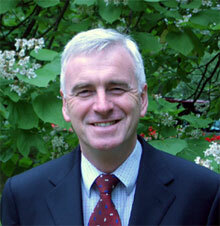 John McDonnell MP was elected for Hayes and Harlington in 1997. He serves as Chair of the Socialist Campaign Group, the Labour Representation Committee and the “Public Services Not Private Profit“ Group. John is notable for his anti-war platform and his views have prompted some controversy in the past. He voted against the Iraq War in 2003 and was one of only twelve Labour MPs to back an inquiry into the Iraq War. He is a member of the World Development Movement, a membership organisation which campaigns on issues of global justice and development in the Global South. You can access John McDonnell’s personal website here.